Mr. Jerry Plato Smithey, age 72 of Moravian Falls, passed away Tuesday, November 20, 2018 at Forsyth Medical Center surrounded by his loving family. Funeral services will be held 12:30 Friday, November 23, 2018 at Oakwoods Baptist Church with Dr. Earl Davis, Rev. Robert Duncan and Rev. Rodney Blake officiating. Burial will be in Cherry Grove Baptist Church cemetery. The family will receive friends from 11:00 until 12:15 prior to the service at the church. Mr. Smithey was born February 7, 1946 in Wilkes County to Plato and Gracie Ball Smithey. Jerry was in the United States Army during the Vietnam War and served in Korea. 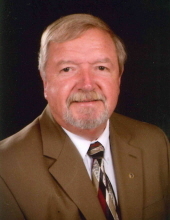 He was a Member of Oakwoods Baptist Church where he served as a Deacon for 35 years, currently serving as Head Deacon. Jerry was retired from MW Window Manufacturing where he worked as a Sales Rep. He gave much to the community having been a founding member of the Brushy Mountain Ruritan Club where he had served in many capacities including President, was a founding organizer of the Brushy Mountain Apple Festival where he served in many roles, was a former Zone Governor for the Ruritan Club and was a former President of the Brushy Mountain Volunteer Fire Department. He was preceded in death by his parents and a sister; Shirley Cardwell. Mr. Smithey is survived by his wife; Betty Oakley Smithey of the home, a son; Mark Edward Smithey and wife Melissa of Huntersville, a daughter; Heather Smithey Cathey and husband Jeff of Troutman, five grandchildren; Maddie, Mallory and Mason Smithey and Luke and Dylan Cathey, two sisters; Virginia Alexander of Statesville and Wanda Brookshire and husband Paul of Hiddenite and two brothers; David Smithey and wife Lois of Moravian Falls and Darrell Smithey of North Wilkesboro and brother in law; Arland Cardwell of North Wilkesboro. Flowers will be accepted or memorials may be made to Oakwoods Baptist Church 2385 Brushy Mtn. Road, Wilkesboro, NC 28697. To send flowers or a remembrance gift to the family of Jerry Plato Smithey, please visit our Tribute Store. 100 Cherry Grove Baptist Church Rd. "Email Address" would like to share the life celebration of Jerry Plato Smithey. Click on the "link" to go to share a favorite memory or leave a condolence message for the family.